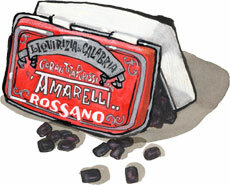 Rossano Licorice for sale. Buy online at Zingerman's Mail Order. Gourmet Gifts. Food Gifts. The Amarelli company in Southern Italy has officially made licorice for 250 years, but family records go back to the early 1500s, making them one of the oldest family-run firms in the world. That's a lot of practice making licorice. It's probably not a surprise that it's really good. Rossano is my favorite. It's 100 percent licorice—not for the faint of heart. Open the tin's red lid, lift the parchment paper, and you'll see a jewel box of hard, square, small, shiny pieces, each one the size of a pea. Rest one on your tongue so the flavor unfolds slowly as it dissolves. It starts as bitter and sweet, gradually growing more and more complex. Dark flavors mix with leather, smoke and bay and then brighter herbal flavors kick in. The sweetness grows, too. You’re left with a hint of licorice flavor that’s light and lingering, very enjoyable. Eat one piece in the late afternoon with a cup of coffee and you’ll be enjoying its after-effects an hour later. I'm used to customers telling me what they cooked with our food, but this one took me by surprise. Elaine DiMasi took the words I wrote for Amarelli licorice, sent them around the world for a dozen people to sing then folded them into music. It's sung in a renaissance polyphony called a madrigal, which turns out to be kind of appropriate since Amarelli began making licorice during the renaissance. Thanks, Elaine!